LGBT (Lesbian, Gay, Bi-Sexual & Transgender) issues have been a major debate in our society the last two decades of the 20th Century and continues to be in the first two decades of the 21st Century. Whether it is marriage, child rearing, bullying or hate crimes there isn't a topic that doesn't include some element of LGBT. Contrary to media and some political talking heads, most Americans want everyone to be who they are. It only becomes a problem when militant activity overrides the civil rights issue. We have much to agree with on this subject if we would not let the very small militant groups dominate the conversation. Separating political agendas and fringe militancy from the honest social debate on this issue is needed. LGBT demographics were revealed in a 2017 Gallup poll concluded that 4.5% of adult Americans identified as LGBT with 5.1% of women identifying as LGBT, compared with 3.9% of men. A different survey in 2016, from the Williams Institute, estimated that 0.6% of U.S. adults identify as transgender. Follow the debate below. Tifanny Abreu meets international standards for participation in women’s sports, but she still faces skepticism at home. Tifanny Abreu was leading her team in a key volleyball match last month when the opposing coach called her a man. 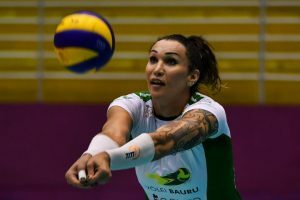 Abreu is the first transgender volleyball player to compete on a professional women’s team in Brazil, and the comment was criticized widely in LGBTQ circles after it was aired on TV. But it also inspired critics of Abreu, including former volleyball star Ana Paula, to rush to the defense of coach Bernardo Rezende, who is better known as “Bernardinho,” or “little Bernard.” “There’s a noisy minority that wants to force us to accept at all costs that feelings are more important than facts and biology,” Paula wrote on Twitter. “They are not.” Bernardinho apologized, but his remark about the 34-year-old wing spiker rekindled a debate in Brazil about trans women and whether they should be allowed to compete professionally on women’s teams. A liberal bisexual teen and a gay conservative talk about being boxed in by labels. Who Else Is Excluded From Military Service? NC GOP Drops Verbal Nuke On NCAA: Why Not Merge Men, Women’s Sports? "They're coming for my son ... and it won't be long before they come for yours."